The line-ups & conjunctions of four naked-eye planets just west of the Sun - see also here, here, here, here, here, here and here plus an animation; a close Venus/Jupiter conjunction on May 11 & 12 is the next highlight - have been a great show in Southern and extremely tough to see in mid-Northern latitudes. Here are impressions of May 9 from Argentina, California and Australia, of May 8 from Austria, Jordan, Turkey and Australia (again), of May 7 from Chile, Italy, Austria (daytime close-ups!) and Tasmania, of May 6 from the U.S. and Austria, of May 5 from Argentina and Australia, of May 4 from Australia, of May 3 from Australia, of May 2 from Chile, of May 1 from Chile (cropped), the U.K., Australia (again and again) and the Philippines, of April 30 from Florida and Venezuela and of April 29 from New Zealand. In small bodies news a big paper on how to get asteroid shapes from lightcurves and stellar occultations, the funny lightcurve of 2010 TU5, another 2005 YU55 press release (picked up here and here) and a long German story on NEO defense. • In Poland a meteorite hit a house (more, more and more) and a new mineral - named krotite - has been found in a meteorite. • There is a 3rd mag. 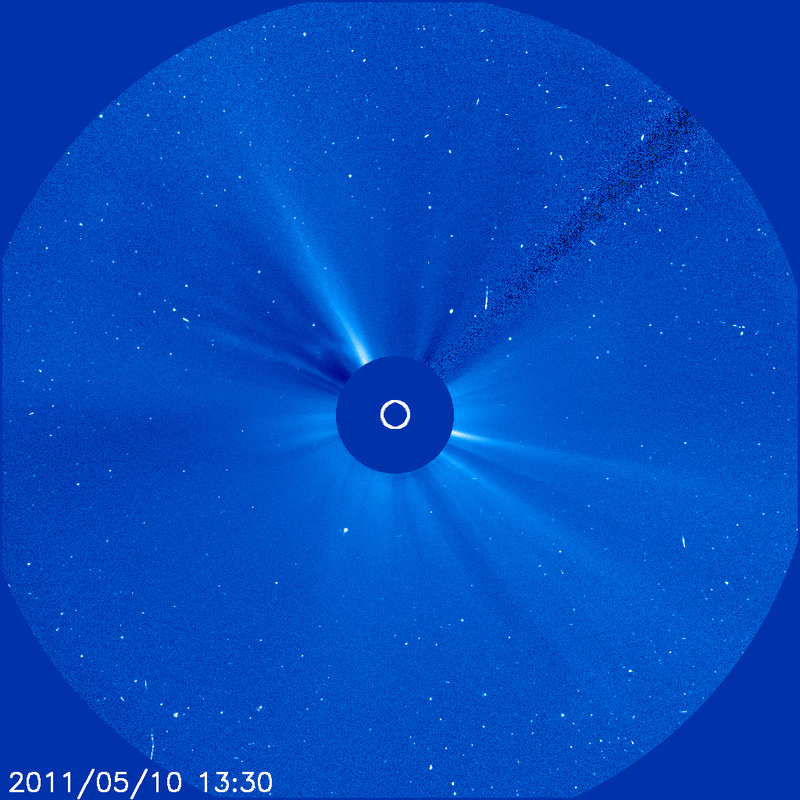 Kreutz comet in this May 10 SOHO image at 7 o'clock (earlier today), comet Elenin on May 4, May 3 (more) and more dates, with absurdly high, optimistic and pessimistic predictions around, and new comet websites with hot visual estimates and Argentinian pictures. In other news The H-Alpha Sun on May 3 and a geostorm on April 30. • T Pyxidis might be fading after brightening (another report). • SN 2011by has risen to 12.3 mag. as many confirm. • Eps Aurigae is now in egress with the eclipse soon over - and a lot of science results left behind. • Two more fine sky timelapse movies from the Canary Islands and Greece. • Close-ups of NanoSail D here and here, a Brasilian reentry video, explained here and here (more and more on the satellite), a Russian sky show after a launch, explained here and hier - and a close-up of USA 129, a U.S. spysat.